Real Madrid: Is Santiago Solari one win away from landing manager's job? Three wins from three, in three different competitions. It's not a bad way to start an interview for one of football's biggest jobs. True, the opposition have not been too testing: Solari's wins have come over third division Melilla in the cup, Real Valladolid in the league, and Czech side Viktoria Plzen in the Champions League. 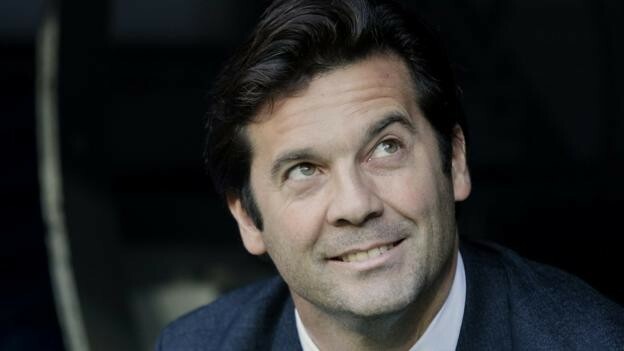 Speaking on BBC Radio 5 live's Football Daily, BBC Sport columnist Guillem Balague explains the key factors that put Solari in such a strong position. They turned to 42-year-old Solari, who was in charge of the club's reserves. He was promoted from within - just like Zinedine Zidane in January 2016 - albeit only "provisionally". "I am not sure Real Madrid look so different under Solari. They're not looking much better, just a bit more confident," Balague said. "But looking at the line-up for Wednesday's win in Plzen, you realise what Solari has been doing best of all: keeping one very important person happy in particular - Florentino Perez. "He left Luka Modric, Marco Asensio and Isco on the bench, which gives the message that everybody has to earn their place. Dani Ceballos was put in to show there is depth. There was a Champions League debut for 21-year-old academy graduate Javi Sanchez. "And he also played Vinicius Junior. It is an unwritten rule at the club that Vinicius has to play, because the 18-year-old Brazilian cost 45m euros (£39.1m), although some people say the deal was worth 65m euros (£56.5m). "Lopetegui would have felt the pressure, coming from Perez using his friends in the media, to select him, and all of these decisions make the club's president very happy." Former Spain boss Lopetegui of course had to cope without Cristiano Ronaldo, for so many seasons the club's talisman before a £99.2m move to Juventus this summer. But Balague said his methods on the training pitch and tactics also played a role in failing to follow on from Zidane's impressive reign. "Lopetegui is of the Johan Cruyff school of management, and he wants his teams to always play in a certain style, whereas Madrid over recent years have been much more about improvisation, leaving quality players to do the rest. "It was perhaps a mistake for Madrid to choose him, because Lopetegui was not going to change. "Solari has realised that you have to open the doors, let all of the tension out. He has allowed the players to forget responsibilities and obligations and express themselves. "He has gone back to the Zidane style: go out and enjoy yourselves. "Karim Benzema, Alvaro Odriozola, Casemiro, Dani Ceballos have all already been affected positively by the change and have said he should stay. 'We would kill for him,' they said. "And Gareth Bale is scoring, which will give him the confidence he really needs." So is it Solari's job to lose? "Perez had wanted to appoint the former Chelsea boss Antonio Conte, and that didn't happen because, in a big way, Sergio Ramos said it shouldn't be him," added Balague. "Now, taking Conte aside, it's not clear who else there is. "Madrid played a very strong side in Melilla and got a much-needed win. They were perhaps lucky to beat Valladolid and then came the victory in Plzen. "If it's a disaster against Celta, then they will look for something else. If it isn't, then in Solari goes. That is Real Madrid."